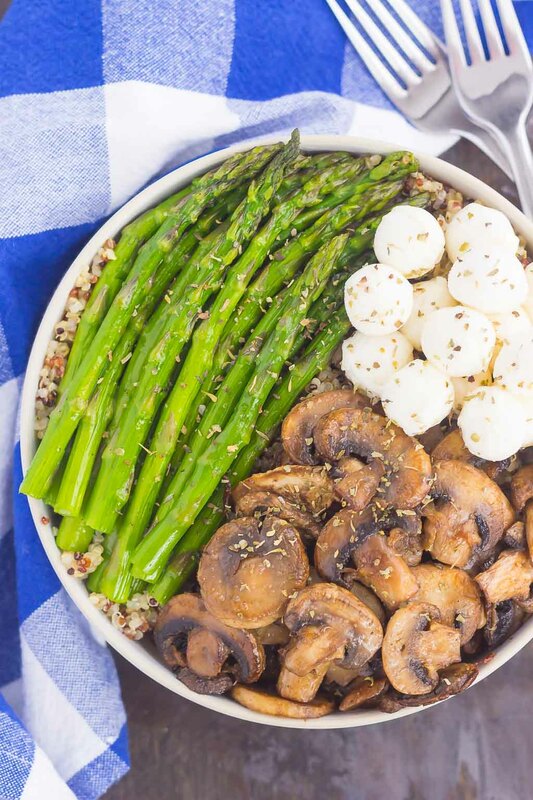 If you’re looking for a new favorite recipe, this Asparagus and Mushroom Quinoa Bowl will become a regular in your meal rotation. Hearty quinoa is tossed in a white balsamic dressing and then topped with roasted asparagus and fresh mushrooms. Fast, fresh and flavorful, this easy meal makes a delicious lunch or dinner! Sometimes you just need a little comfort food in your life. Chicken noodle soup, grilled cheese sandwiches, or a hearty pasta dish always come to mind when I need a home-cooked meal. And while those foods don’t necessarily remind me of summer, they are still delicious all the same. So when I had a craving for comfort food this weekend, I did a little creative improvising. Seeing that we’re smack-dab in the middle of summer (can you believe the 4th of July is already over?! ), whipping up a pot roast just doesn’t sound appealing to me. That’s more of a fall or winter type food, right? So I decided to combine a few of my favorite ingredients for a lighter, healthier, and summery type of comfort food. Sure, this dish requires the use of a stove, but it’s not as labor intensive as a pot roast, and is ready in less time. Let’s start with the first ingredient: quinoa. I love the hearty grain and texture of this seed. It’s so versatile, healthy, and delicious! I almost always keep a box of it in my kitchen so that I can add it to salads or other dishes. Next comes mushrooms. I absolutely adore this vegetable! Whether I add them to pizza, pastas, or whip of my favorite side dish, mushrooms will always hold a special place in my heart. And finally, asparagus. Like mushrooms, I love adding asparagus to just about anything. Combine that all together with a white balsamic dressing, and this Asparagus and Mushroom Quinoa Bowl was born. 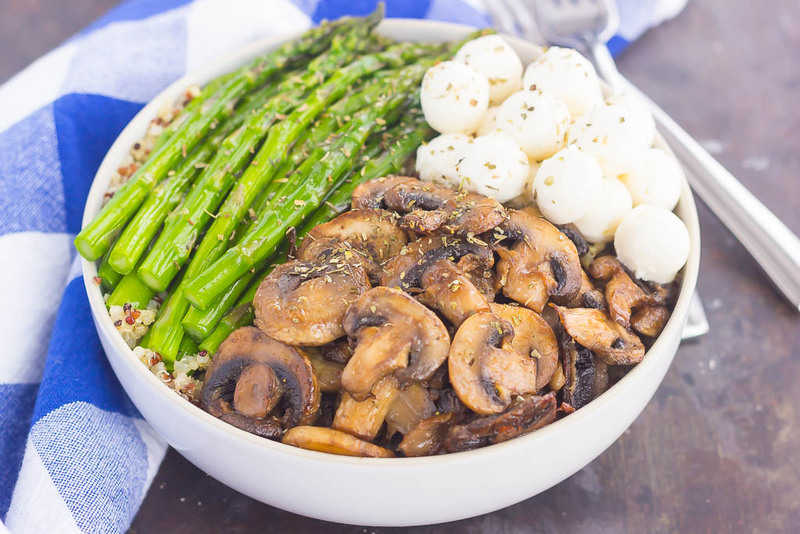 This Asparagus and Mushroom Quinoa Bowl is a cinch to throw together! Each part is prepared on its own, and then tossed together at the end. You already know the main ingredients, so let’s talk specifics. I used regular quinoa for these bowls and prepared it as normal, except that I substituted chicken broth for water. While I usually cook quinoa in just water, I found that the chicken broth gave it a subtle flavor. But feel free to use a flavored quinoa or to prepare it using water or vegetable broth instead. Once the quinoa is cooked, pour it into a large bowl and set aside. To prepare the mushrooms, I used my Baked Parmesan Garlic Mushrooms recipe and baked them, instead of sautéing. This recipe uses seasonings that help give this dish a tasty appeal, full of flavor! While the mushrooms are baking, steam the asparagus and season with salt and pepper. Once the vegetable are cooked, mix in with the cooled quinoa. The white balsamic dressing is (almost) my favorite part of this Asparagus and Mushroom Quinoa Bowl. It’s lighter and a bit sweeter than regular balsamic dressing. If you haven’t tried white balsamic vinegar before, I highly recommend you start using it! It will definitely put a new twist on your recipes. To make this simple dressing, I combined olive oil, white balsamic vinegar, and seasonings in a small bowl. Once whisked together, I poured into the quinoa mixture and tossed. And that’s it! One bite and I knew I had found my new summer comfort food favorite! The quinoa pairs so well with the mushrooms and asparagus. And the dressing! Talk about love at first bite! 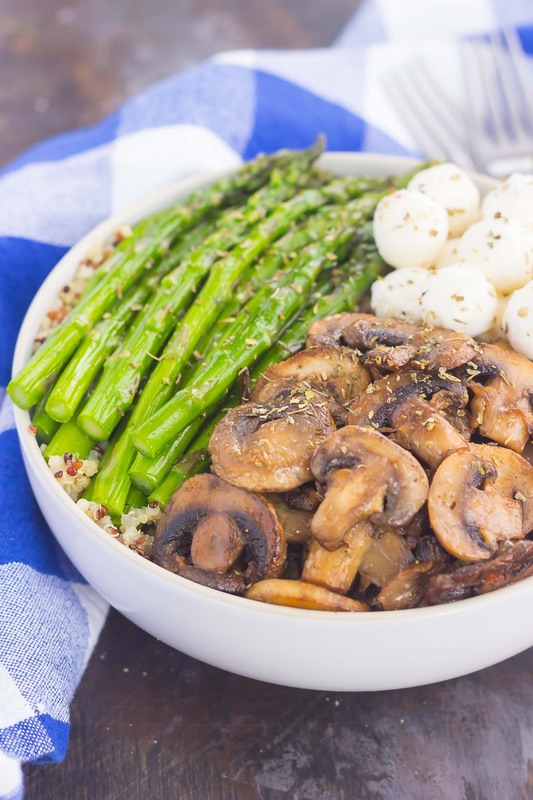 It gave the Asparagus and Mushroom Quinoa Bowl a sweet coating, perfect for this time of year! This dish is light and refreshing. I chose to eat it as a main dish, but feel free to add in chicken or beef to bulk it up. And the best part of this dish (besides being easy to make) is how versatile it is. If you don’t like asparagus, swap for broccoli. Had enough of quinoa? Switch it out for pasta. Want more veggies? Add in some corn or tomatoes. Easy peasy! 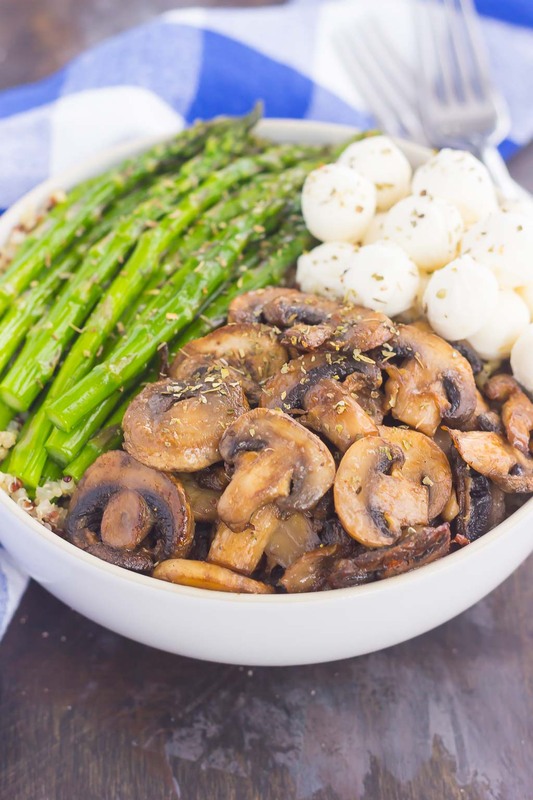 So If you’re looking for a new favorite recipe, check out this Asparagus and Mushroom Quinoa Bowl! Full of protein, fiber, and vegetables, this dish will keep you full and satisfied, without weighing you down. Looking for more quinoa recipes? I’ve got you covered! Line a large baking pan with parchment paper or lightly coat with non-stick cooking spray. Arrange asparagus in an even layer on baking pan. Drizzle with olive oil and season with salt and pepper. Toss to coat the asparagus. Bake for 8-10 minutes, or until asparagus is crisp on the outside and tender on the inside. Remove from oven and set aside. While asparagus is roasting, cook quinoa according to packaged directions, using chicken broth for liquid. While quinoa is cooking, prepare Baked Parmesan Garlic Mushrooms according to directions. Alternatively, you can saute 8 ounces mushrooms in a large skillet with 2 tablespoons unsalted butter. Season with salt and pepper, to taste. Once quinoa is cooked, add olive oil, white balsamic vinegar, salt and pepper to pot. Toss to coat. Adjust dressing, if needed. Pour quinoa into a large bowl or four separate bowls. Add roasted asparagus, mushrooms, and top with mozzarella pearls, if desired. Quinoa dish can either be served cold or warm. 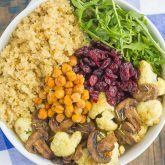 I am happy I came across your blog because these Quinoa Mushroom Bowls look fabulous - such a simple and filling side or main dish! Looking forward to trying this in my kitchen! Pinned! I'm so glad you found my blog, Ceara! I love finding new ways to use quinoa, and since mushrooms and asparagus are my favorite veggies, it seems like a great way to combine the two. And thanks so much for the pin! I love finding new ways to use quinoa! This looks so fresh with the mushrooms and asparagus. I love incorporating quinoa into just about any dish that I can! Combining it with mushrooms and asparagus is a great (and healthy) way to have a light lunch or dinner! Thanks so much, Medha! If you like balsamic vinegar, I think you will love the white balsamic kind! It's a bit lighter than the regular kind. You should be able to find it at any grocery store, where the other vinegars are shelved. I hope you love this recipe if you try it! And let me know if you like the white balsamic vinegar! Thanks, Christin! I love mushrooms in just about anything...from pizzas to pasta, or just by themselves! So it seemed like a great way to jazz up some quinoa! Light, healthy, and delicious! I'm all about comfort food! We had pulled pork this weekend and I was like, yes, this is GOOD. Mushrooms and quinoa have the same effect! Chicken broth is one of my favorite things - who knew something so simple would make things so delicious? Great recipe Gayle! Pulled pork is one of my favorite comfort foods too, Mary Frances! And this dish definitely fulfills that same category for me. It's hearty, yet light...perfect for the summer! This is fantastic for summer! I always think of warm winter meals when I think of comfort food, so this is a great change up! Thanks, Leah! This is definitely comfort food, with a lighter twist! These quinoa bowls look amazing! I'm a huge quinoa fan, AND I love mushrooms that are cooked/baked...I could dive right into this! Thanks, Jessica! I think the mushrooms give these quinoa bowls an added touch! 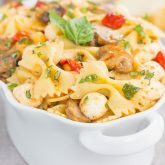 Mmm, the added baked parmesan mushrooms sound amazing, but I like the fact that you can easily sub in different ingredients. Great little healthy meal! 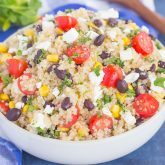 This quinoa bowl is so versatile! I've swapped out the asparagus with broccoli and added in corn before. It's very easy to make this a hearty main dish with chicken or beef added, too. This looks like a great combination! Plus, one bowl means less dishes and that's always awesome. Hope you had a good weekend. The mushrooms and asparagus go quite well with the quinoa! This dish is so easy to whip up, too. Hope you had a good weekend, too, Bri! I love this recipe because it includes mushrooms and asparagus and both are so good for you, and duh, the quinoa too =) Mushrooms I was just reading are especially good for blood sugar control. And I agree, just because it's hot doesn't mean you don't want lots of comfort foods! Looks delicious, thanks for sharing. Thanks, Laura! I think mushrooms and asparagus just might be one of my favorite veggie combinations. And with the quinoa, it's a healthy meal that feels like comfort food! Thanks so much, Arpita! Asparagus and mushrooms are definitely a dynamic duo in my book. Yay for quinoa!! :) Clearly my favorite :)! I know you love quinoa, too, Chelsea! So versatile in many different dishes! I love using it in these bowls to jazz up the veggies. I love how practical and easy to put together these bowls are. I know what we're having for dinner tonight :) Great recipe Gayle. Thanks, Kathy! This meal is so easy to whip up, tastes great, and is healthy. I hope you enjoy this if you try it! Hi Gayle, love how you treated each component of this dish, great combination! Thanks so much, Cheri! Each ingredient is wonderful on its own, but when combined, they taste amazing! Thanks so much, Annie! I'm so honored that you tried (and loved) my baked mushrooms. They are perfect in these quinoa bowls! I'm probably the only person left on the planet that hasn't tried quinoa. I NEED to buy some and try it. I love the mushrooms and asparagus together. My husband would definitely flip over that. Pinning! Quinoa definitely have a different taste, but it's nice to use it in place of rice or noodles. 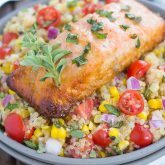 I first tried quinoa about a year ago, and I've been hooked ever since! With the mushrooms and asparagus in here, these bowls are light and healthy. Sounds like it would be a great meal for your husband! I love this! I am obsessed with mushrooms, can't get enough of them. This would be great for meatless monday! This is definitely a great meal for meatless Mondays, Natalie! I always fill my bowl with extra mushrooms, because I absolutely adore them. Mushrooms are one of my all time favorite foods... this sounds amazing! We have been trying to eat less meat lately and this seems like an awesome filling veg dish! Mushrooms are my favorite, too! This would make a great vegetarian dish, healthy and light, yet filling! This looks terrific! Funny how "comfort" foods vary so much by season! Thanks, Julie! I completely agree with you! The types of food I crave depends a lot on the weather! Thanks, Kathi! This dish is the perfect summer comfort food! Sounds like you would love this recipe, Olivia! Light, healthy, and full of delicious veggies! Thanks, Tina! I'm loving this light and healthy dish, too! Thanks, Isadora! I'm always looking for new ways to use quinoa so it's a staple in my pantry! This recipe is very easy, and perfect to throw together for a light and healthy meal. Love all these ingredients! We have been living on quinoa and asparagus this summer, although not together! Loving your summer comfort food! Thanks, Denise! Quinoa and asparagus are great for the summer. I love how light and healthy they are! Asparagus, mushrooms. and balsamic is such a perfect flavor combination. Baked mushrooms have so much flavor, too! These quinoa bowls look like the perfect light, Summer comfort food. I can't wait to cook it up! Thanks so much, Maggie! This dish screams comfort food to me, and the baked mushrooms add an extra special touch. Thanks for stopping by! I love everything you've packed into these bowls Gayle! I eat mushrooms so often and when it's asparagus season it's in everything! These would be such a great lunch to eat every day of the week! Thanks for the kind words, Marcie!